The Tree of Life, that simple yet all-comprehending diagram, is devised with so profound a philosophy that it represents the subjective as well as the objective worlds and serves to indicate the relationship between them. The Ten Holy Sephiroth sum up the objective world on all its levels and in all its aspects, together with its different phases of evolution; and when we remember that the different aspects, according to the Doctrine of Emanations, correspond to the successive phases of evolution, just as do the various stages of animal organization from the single-celled organism for the vertebrate, we shall see how comprehensive is this glyph which can be applied horizontally to time and vertically to type, epitomizing, in fact, the whole of the evolutionary theory of life and form. By its use the Qabalists built up an evolutionary philosophy in the darkest of the Dark Ages of the mind; and by its use the modern philosophical mystic is enabled to transcend the limitations of a materialistic science and forecast developments of knowledge that have not yet dawned above the horizon. In tropical countries there is seen a false dawn, due to the reflection from the sky of the beams of the sun as yet below the earth-bend. The speculations of the philosophical mystic, deducing from first principles, have many times foreshadowed the advance of knowledge before the technique had been developed that makes its data available. The objective aspect of the Tree has been dealt with in detail in the “Mystical Qabalah,” together with the philosophical concepts on which the whole Qabalistic scheme is founded, and to this book the reader must refer if he is to understand the present pages – unless, of course, he is already familiar with the viewpoint of esoteric philosophy, for the subject is too extensive to admit of a satisfactory summary. In these pages I propose to deal with the subjective aspect of the Tree as it serves to classify the different factors in consciousness and serve as a basis for the technique of their development and objective use, which is traditionally called magic but might much better be called applied psychology. If the reader will look at the diagram of the Tree of Life in the “Mystical Qabalah,” he will see the Ten Holy Sephiroth arranged in their traditional pattern of three columns, and between them the Twenty-two Paths, which were not touched upon in that book, for they refer to the subjective aspect of the Tree as it is applied to consciousness and the powers of the mind. The Ten Holy Sephiroth themselves are conceived of as linked one to another by the zigzag course of the Lightning-Flash, which represents the line of the course of evolution, descending from Kether to Malkuth; the Twenty-two Paths, however, are united by the coils of the Serpent Nechushtan, the Serpent of Wisdom, which loops one to another, laboriously upward, till its crowned head rests upon Kether, thus indicating the evolution and initiation of the soul of man. Just as in the case of the Ten Holy Sephiroth, there is a wealth of symbolism assigned to each Path, with, however, certain important differences. There are no Deity-names, indicating aspects of the manifestation of the Godhead, assigned to them, nor, in fact, any Name of Power, angelic or otherwise, for the classification employed upon the Paths is in terms of the Mundane Charkas. These are the spheres of the manifestation of the powers they represent, and their points of contact with the higher powers have to be sought indirectly. Four sets of symbols are placed upon these Paths: firstly, the numerals from eleven to thirty-two, and among Qabalists the Paths are commonly referred to by these numbers. For our purposes, however, we will couple with the numerical terminology the name of the mundane sphere represented, for this presents the symbolic content of the Path and all its associations far more effectually than the abstract impersonality of a numeral. These twenty-two numeral run from eleven to thirty-two because the numerals from one to ten are assigned to the Sephiroth themselves; they serve to correlate the Paths with the aphorisms of the Sepher Yetzirah, which set forth in concealed symbolism their mystical meaning of each Path and represent its significance in Atziluth, the highest and most abstract of the Four Kingdoms of the Qabalists. The Yetziratic Texts assigned to each Path are, in actual fact, the equivalent of the Deity Names of the Sephiroth; that is to say, they indicate the spiritual essence of the Paths. The significance of these aphorisms is only appreciated after prolonged meditation and much practical experience of the Path in question; one learns little or nothing from the reading of them. The second set of symbols attributed to the Paths refers to the mundane spheres of manifestation of the forces represented. These consist of the Four Elements; the Seven Planets; and the Twelve Signs of the Zodiac. These, however, make twenty-three in all, but for practical purposes the Element of Earth is ignored, as the Paths represent the aspects of the higher consciousness, and the Element of Earth, in this system of notation, corresponds to sensory consciousness, which is objective, and therefore belongs to the Sphere of Malkuth in the Sephirotic system. This is a very important key to the use of the symbolism, and its withholding constitutes one of the ‘blinds’ of which the ancient initiates were so fond. It is obvious that confusion must follow if one tries to fit twenty-three symbols onto twenty-two Paths; it is vital to the system to know that the link between subjective and objective is the Element of Earth; it is actually upon this point that the raison d’être of operative magic and all the symbolic working depends. The transference from subjective to objective cannot be short-circuited, but must always proceed via Malkuth, for this is the one factor that is common to both systems. Anyone who is acquainted with astrology knows that the Signs of the Zodiac are related to the planets as their Day and Night Houses, and the signs of their exaltation; they are also classified into Triplicities under the Four Elements; the Four Elements are further attributed to the four lowest Sephiroth, and the seven planets to the Sephiroth from the Third to the Ninth. It will thus be seen that by means of the mundane symbolism the Paths can be correlated with the Sephiroth. In addition to this, each Path is held to represent the equilibrium of the forces of the Sephiroth it connects. In these significances is to be sought the key to esoteric astrology and talismanic magic. The third set of symbols attributed to the Paths is the Hebrew alphabet, in which each letter also has a numerical significance. Out of this association of numbers and letters has been developed the tangled jungle of he Gematria – a kind of celestial mathematics very susceptible of abuse. In this system it is taught that the significance of a word can be deduced from an examination of the number or numbers into which its letters can be translated and the factors to which they can be reduced, not only by the usual arithmetical rules, but by the addition of their digits. This is a pretty elastic method, as can readily be seen, and to rely upon it for the mensuration of the universe, even in its subtle aspect, is like trying to draw a straight line of a given length with an India-rubber ruler. When this method is applied to the Words of Power, however, it is a different matter; for these are deliberately built up on gematrical principles and contain formulae. They are not so much composed of letters that can be translated into numbers, as of numbers that have been translated into letters. The whole subject is immensely complicated, and in my opinion of insufficient practical value to justify the labor involved in wrestling with it; it is an art rather than a science, for exactitude is impossible with it owing to the various alternatives that are always available. It is a curious kind of mental calisthenics, and the mystically-minded mathematician can obtain some very suggestive results; for although the choice of methods for reducing a given word to its numerical value effectually prevents Gematria from being in any sense an exact science, they, by their very elasticity, render it an effectual form of psychoanalysis, wherein the mind selects intuitively the method that will yield the symbolism that has significance for it. Viewed in this way, the complicated game of Gematria is of much interest, but it should always be borne in mind that one person’s results are not valid for another, this being a path by which one can travel hopefully, but has no prospect of arriving at any final goal. Its true value lies in its elucidation of the latent significance that symbolism has for the individual mind. The fourth set of symbols to be applied to the Paths consists of the Major trumps of the Tarot pack. The fact that these are twenty-two in number indicates their obvious application to the Paths, but as they are numbered from nought (0) to twenty-one, we find here another blind. In the exoteric systems, the Tarot trump number one is placed on the Eleventh Path, and so on down the Tree, the card numbered nought (0) falling upon the Path that remains over at the bottom. Thus arranged, there is no conceivable relationship between the significance of the Paths and the symbolism of the cards, indicating clearly that this method of attribution is erroneous. The esoteric system, as taught by McGregor Mathers to the initiates of the Order of the Golden Dawn, has been several times published already, so there seems to be no particular point in making any further mystery about it. According to this system, the Tarot trump numbered nought (0) is placed on the Eleventh Path, and the others follow in succession, with the exception of the Eighth and Eleventh, which exchange places. This system of attribution brings the Twenty-first Trump onto the Thirty-second Path, and all the symbolism falls harmoniously into place and the whole system becomes comprehensible. The Tarot method of Divination is thus seen to be related to astrology and much light is thrown on both subjects. From the data thus assembled, and especially from the Yetziratic attributions of the Paths, as their assignment to the astrological and elemental symbols is called, a very great deal can be deduced by means of meditation and the imaginative use of the intuition; for through the astrological symbolism relations can be established with the pagan pantheons, as Mme. Blavatsky has shown. The four color scales are also applicable to the Paths, and these are important in relation to the practical workings, as will be explained later. Likewise certain magical weapons, precious stones, and perfumes. Furthermore, it is traditionally held that just as a spiritual experience is assigned to each Sephirah, so a certain type of magical power is assigned to each of the Paths. 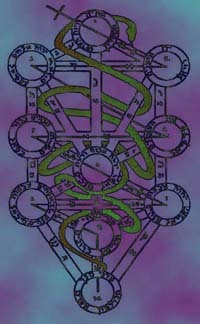 In all the magical Orders that use the Qabalistic method, the grades of initiation are attributed to the Sephiroth, and each grade is held to open to the initiate the corresponding Paths that connect the Sephirah with those above it. The symbolism of the rituals has reference to the Paths concerned, and cannt be understood apart therefrom, and the practical work of the Degree, in any Order worthy of the name, should consists of the mastering of the magical powers referred to the Path in question. The tendency in those Orders with which I have been acquainted has been to push the practical work higher and higher up the Degrees, till it ends in certain ones by vanishing beyond the Abyss, thus passing off the physical plane altogether and ceasing to be what can reasonably be called practical work. McGregor Mathers, whose Order of the Golden Dawn is the parent of most of the modern magical Orders, removed all practical work from the degrees corresponding to the four lower Sephiroth despite the attributions of the Paths connected with them, thus rendering confusion thrice confounded so far as the interpretation of the symbolism of those degrees was concerned. Students, in consequence, had to work in the dark for several years because no explanations of the significance of what they were learning could be given them. Except as a test of faith and perseverance, such a method of training was valueless. Nevertheless, the reason for the withdrawal of the practical work can easily be seen. It is no more possible to turn the theory of magic into practice without long and careful training than it is to turn the theory of music into melody. It was to furnish a preliminary training that I established the Fraternity of the Inner Light with the approval of Mrs. McGregor Mathers who took over the headship of the Order after her husband’s death. The tendency of the various disjecta membra of the Golden Dawn that, like a cut-up star-fish, are developing into new organizations since the passing away of those competent to hold authority, is to reintroduce the practical work into the lower degrees. What results they obtain, I do not know, but I do know that to teach the practical work of magic to untrained and untried persons is to run a considerable risk. If the experiment is not abortive, it is apt to be explosive. Nothing save the most spasmodic results can be obtained without a thorough grounding in the elementary technique, any more than they can be obtained with a violin.